Really?! 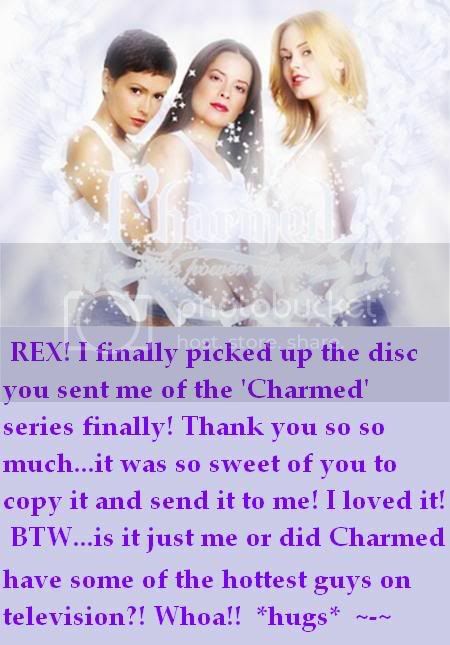 Had you ever watched 'Charmed'? YES! I actually could have used a bit more Wyatt and Chris! LOL!! that's good to know. after i saw the other bday post of yours, i thought i had missed wishing you a happy bday! Let me see, the Source of all Evil was hot as hell (pun intended). Pheobe has the hottest boyfriends. Darrel was my favorite. Soooooooo good. They need to do a Charmed spin-off with the boys. I really thought Chris was hot, I love his character, too. He started out as a model, btw. And that season (6) he's in is my favorite Charmed season. Anyone watch the movie 'Latter Days'? The guy that plays Wyatt (Wes Ramsey) grown up plays the dude that falls in love with the blond Mormon guy in 'Latter Days'. OMG! THAT'S who Wyatt was!!! I knew I recognized him! Not to mention Victor Webster of Mutant X fame, and Eric Dane who appeared in X-Men 3 as Multiple Man. Do I watch too much TV and film or what? YES! Mutant X...both Victor and Forbes March were so hot...and even Michael Ontkean (older guys can be hot too! ).